Florida Gators offensive coordinator Kurt Roper met with the media on Tuesday to provide some thoughts on his team’s recent upset victory and upcoming road game against the Vanderbilt Commodores, which is set for 7:30 p.m. on Saturday at Vanderbilt Stadium in Nashville, Tennessee. Head coach Will Muschamp told the media after Saturday’s win and again on Monday that there were additional passing plays scheduled to be run against Georgia, but Florida was so successful running the ball that the Gators did not want to take any chances and deviate from what was working. Roper corroborated Muschamp’s claims on Tuesday. “Our focus right now offensively, and the discussions we’ve talked about, if we don’t get better at turning the ball over, it doesn’t matter what we do. We want to be a team that is playing smart, taking care of the football and growing. But there’s no doubt Treon is going to have to be a playmaker in the passing game. Going have to be,” he said. Though Harris still has “some work to do in the passing game,” Roper stated that it is absolutely a dimension of the offense that Florida needs to have going forward. He also believes Harris is prepared to handle the additional responsibility, though he admitted that he cannot predict what the results will be. Not trying to disagree with Roper, redshirt senior center Max Garcia had a different perspective on the Gators’ offensive plans moving forward. “I feel like plan of attack, run the ball first and pass the ball when we absolutely have to. I think that’s going to be our strategy for the rest of the season,” he said. Redshirt junior QB Jeff Driskel not being on the field Saturday was not indicative of his role with Florida for the remainder of this season, according to Roper. Driskel, who has been dealing with a back injury, is still recovering from his ailment but could see some action in a ball-carrying role when he is healthy enough to return. 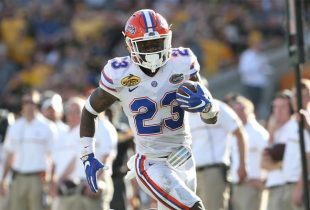 The running backs and offensive line got nearly all of the credit for the Gators’ impressive 418-yard rushing performance on Saturday but there should be no doubt that Florida’s wideouts were equally important, especially when it came to breaking runs to the outside and far down the field. “I felt like it was very unselfish of our wideouts and then their effort and the things they did in the game, as the game wore on, as we continued to have success running it. Obviously, they realized there probably won’t be a lot of balls in the air as we move forward in the game. We had a plan for that going in, but again, as you continue to run the ball like that, don’t change what you’re doing,” said Muschamp. Sophomore Demarcus Robinson in particular was dominant as a blocker. He not only held his own throughout the game, Robison found a way to block two separate defenders during junior Matt Jones’s 44-yard touchdown rush. Suffice to say, he got some well-deserved praise from his teammates this week. “Man, I loved it. Oh man, it fired me up. Just seeing him throw two blocks on one play, on that touchdown with Matt Jones running it down the left sideline. That was just incredible. I’d never seen wide receivers block like that before. It just shows that, you know, we have unselfish players on this team,” Garcia said of Robinson’s effort. Redshirt senior right tackle Chaz Green credited the wideouts as the main reason the Gators had 13 explosive plays on the afternoon. “You know, most receivers don’t like to block. It was fun watching them on film just flying around, blocking people like us [offensive linemen],” he said. A run-heavy team with 4-6 really slick pass plays specially game-planned for that week’s opponent can be successful, particularly if those plays are called at unexpected times and from formations that don’t give them away. I’ve seen Bama and Auburn do that for years. But run run pass, run run pass, run run pass, and asking ANY QB–let alone a true freshman–to convert 3rd and longs all game long when the other team knows a pass is coming and brings the house will not work. Even the occasional jet sweep NOT called to the short side of the field would help keep the defense off-balance. You just can’t be predictable in the SEC and expect to be successful, I don’t care how talented, determined or fired-up you are. I disagree. This is an offensive scheme that is offensive! Gator football is built on scoring, built on utilizing our skilled position players and challenging all aspects of a defense. Don’t get me wrong, I LOVE that we beat our biggest rivalry (I grew up in Jax and subscribe to Spurrier’s prioritizing of victories), but I don’t believe that running the ball 90% of the time is sustainable in the SEC. This is especially true when we NEVER stretched the field. I am shocked that Georgia’s defense was that inept in shutting down the run, but you can be sure that won’t happen frequently against SEC defenses. Let’s be honest, our offensive line played great but this line isn’t a dominating group like the Nebraska O-lines of the mid 80s. I love the victory, but I don’t believe that this is a sustainable game plan for ongoing success. I know that Roper “stuck to the game plan” and it worked this time, but it further demonstrates to me that Muschamp just isn’t the right leader for this program. “Stuck to the game plan”. . . ha ha! I believe that every offensive coordinator under Muschamp has been given no choice but to “stick to the game plan.” When it works, they get praised. When it doesn’t work (i.e. the vast majority of the time), they get thrown under the bus (e.g. Brent Pease). Pease didn’t run Boise State’s offense and Roper isn’t running Duke’s. “Stick to the game plan”. . ha ha. .. good one. Somebody needs to take away his headset when we have the ball. I like the idea of Driskel coming in to run and sometimes throw even. Tebow did that when Leak was the QB and it worked great. The opposing team got to thinking he would just run and then he threw a TD pass. With Driskel coming in it will force the D to play both run and pass and it will be good to see him get some snaps. I still don’t blame the whole thing on him though he definitely deserves blame, but he is still a Gator and we should support him (after a fashion). Tebow also has two National Championships and a Heisman to his name. Have you seen Driskel’s passing this year? It is not a threat. I cannot understand this coaching staff’s infatuation with Driskel. He’s essentially receiving the opposite treatment Brantley received in 2010. Have to agree with you here, it should be obvious for all the Driskel is and has been what is holding this offense back. Sorry Garcia, but the previous coach preached blocking Wide Receivers. Look at Riley Cooper who still takes that as part of the job of a WR. Fundamentals like excellent blocking WR’s is something we need to see executed well like we did against Georgia for us to be successful offensively. Robinson plays like he has a chip on his shoulder and maybe that is something our WR’s are missing as a whole. Then again, maybe that is something that is coached and the kids aren’t getting the coaching they need to be successful. I’m ecstatic about last week’s win and didn’t mind that we ran the ball a bazillion times because it worked, even with 9 in the box. We also attempted to block punts again (which I have a hard time remembering the last time we did that under Muschamp). However, unless we see Muschamp continue on with that ‘change’ how this team executes and the gameplan offensively, he needs to go. The next 4 games will be his litmus test to see if he can get all 3 facets (O,D ST) of the game to be on at the same time. After watching Jeff literally throw away the LSU game and then become a turnover machine against Mizzou, I hope he never ever takes another snap for the Gators. I’d rather have Roper teach Jones to throw than give Jeff another chance to heave a pick six. Driskel threw a gorgeous bomb right in stride that Robinson should have scored on but went down inside the ten. Then he threw a pass right into Westbrook’s hands for the winning touchdown that Westbrook dropped. So, yeah, Driskel lost the LSU game singlehandedly. Treon, on the other hand, going a whole 3-6 with a fumble, was definitely the reason we beat UGA. A few of those 60 handoffs that he made were really nice. Why can’t we just enjoy the win without continuing to massacre Driskel? He’s had a hard run recently but he’s also done some great things as a Gator. He made a lot of plays the year we went 11-2. You mentioned (almost literally) the only 2 good passes* from Driskel this year. Yes, LSU was not ENTIRELY his fault, but the guy did have 3 turnovers in that game that directly led to 10 LSU points. Treon is no world beater, but you know what he isn’t? As bad as Driskel. The only thing this team needed was someone slightly more competent than Jeff at the helm. They have that now, and you saw the result. Florida doesn’t beat UGA, let alone 38-20, with Jeff out there. LOVE THE WIN! Watched the game out here on the west coast with another Gator alum and the rest of the Buffalo Wild Wings crowd probably thought we were crazy. That being said, I started thinking about the fact that the other 2 wins (Eastern Michigan doesn’t count) were by one point after being held scoreless for 3 quarters and a triple overtime home win against Kentucky. I was a bit concerned with Roper’s comments before where he basically said he had a very simple game plan for Treon (run the ball 60 times)….it worked, but what if we were stuffed and went 3 and out 4 times in a row..then what would he have done? Sounds like he would have kept trying the same thing. On the other hand how about the great effort from the O-line? Finally we were moving people and it looked like the strength of our team (which it was suppose to be pre-season). Great job O-line.